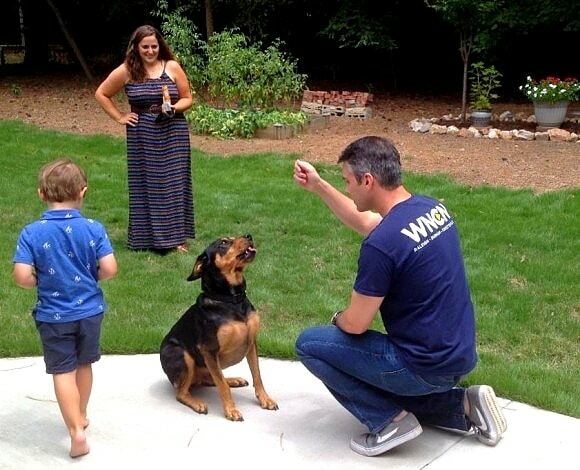 Laura Williams is a massive dog lover, so when she saw a stray wandering around in her Raleigh, North Carolina neighborhood, she knew she had to act. She brought the Rottweiler/German shepherd/Chow mix to a vet’s office to be examined and scanned. Aside from a case of fleas, he appeared to be in good health. 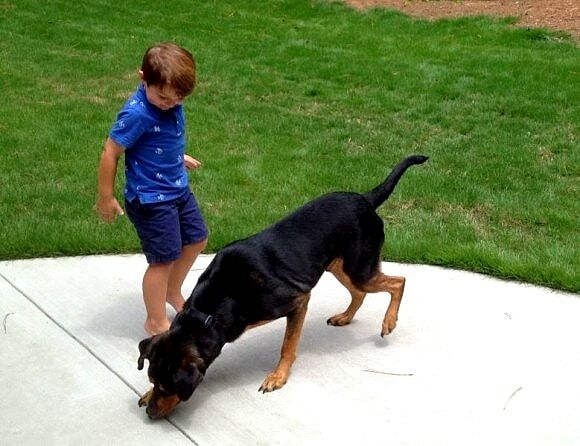 His microchip showed that his name was Zeus, and that he belonged to Melody and Ben Harworth. 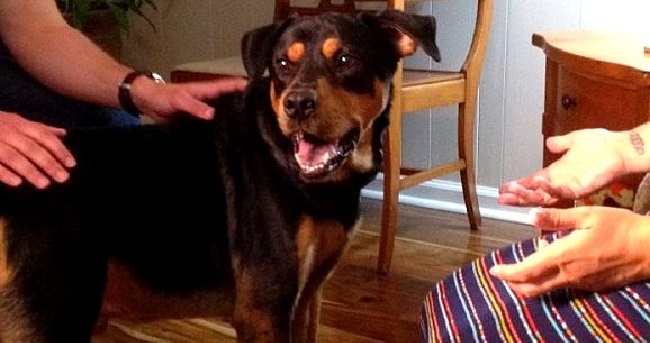 “When I said, ‘we found your dog Zeus’ – because he was listed as lost — they said their dog was dead,” Laura explained. The Harworths are a military family, and now live in Washington state. In 2012, they lived in Georgia with their teenage sons. When they were reassigned to South Korea, Zeus had to stay behind. “A family friend in North Carolina took care of him,” Laura said. But only a few months later, the friend told them that Zeus had died. For now, Zeus is staying at Laura’s father’s house, enjoying the big backyard and friendship with her four-year-old nephew. What really happened? Why did the friend lie about Zeus’ death? Did they tire of caring for him and just let him go? There are many questions, but the important thing is that Zeus is alive and well. The next step is getting him reunited with his family. The news station arranged a Skype meeting. Hoping to get him returned to his family, WNCN general manager and dog lover Doug Hamilton paid the vet bill to get him cleared to fly. 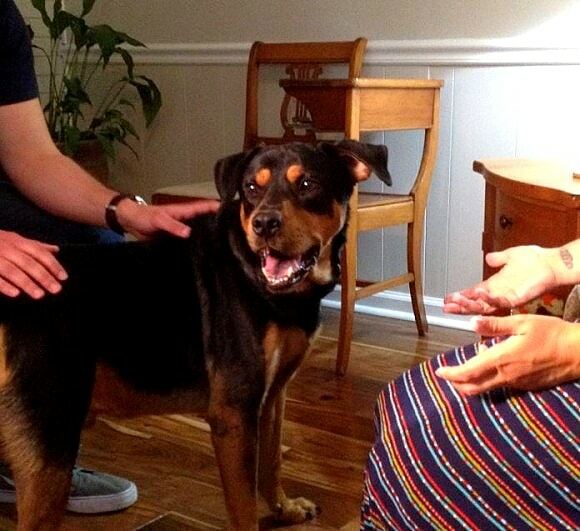 However, because Zeus has heartworms, he isn’t able to fly for six months. So now the station is working on how to have him driven across the country. But after spending more than three years believing their boy was dead, the Harworths know they can wait a few more weeks. Night of the Adorable Puppy Swarm! yes. a feel-good story to start the weekend! Happy that they found him alive, but curious about the “friends” who said he had died. Some friend! Glad he is ok and they are back together. It’s time to settle up with the family “friend” with a few punches to the face and gut. Have they found ground transport yet? Wow, that was no friend that had him and lied to them! Grrrr Cowards! 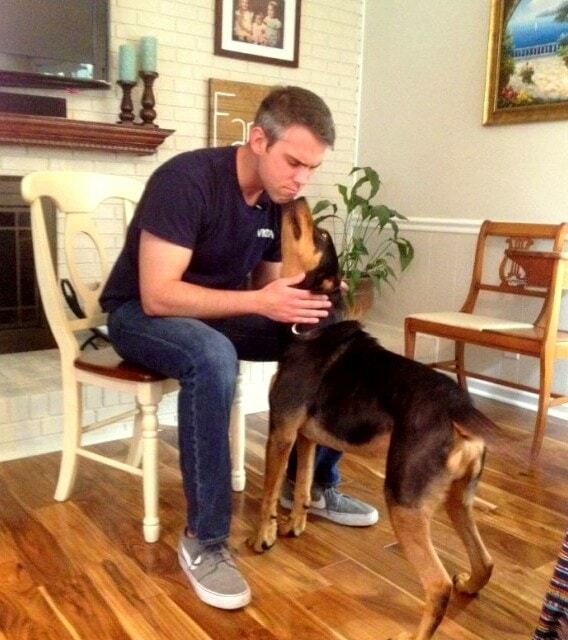 Dogs on Deployment might be able to help! I found a organization that be helpful, RSPCA, by searching “volunteer drivers”. Hope this helps! Hmmm. No, but methinks friendship died, though. Friends like that who needs enemies..
Family friend lost him then lied. Would love to hear followup on conversation w them. Definitely. If that were my baby I would clearly state the persons name, address and phone number in the interview. If I had a photo of said friend I would share that as well. Then I would tell everyone who would listen that I had called that person and here’s what they said after I confronted them…(insert foul language filled outburst!) Something doesn’t add up here. I’m sorry, but I’m naturally suspicious of people. Wonderful reunion story! I hope they severed ties with the so-called friend that lied about the dog. Beautiful ending – I hope your friendship has come to an end!!!! What sort of friends are they – that poor dog, if only he could talk! What kind of so called “friends” would do that!? Hope they get some sort of information of what these people did to the dog at least for some sort of piece of mind or to help the dog deal with some issues he may have in the future. Hope these liars are ex-friends! Is he back home yet? Please update this story !